Unfortunately, British summertime is almost over. As soon as the calendar flips over to September, the sun retires for another nine months, the countdown begins to the clocks going back in October which then shrouds us in eternal darkness (going to work in the dark and then returning home in the dark is not the one), and the country wails in chorus while putting their summer clothes away for yet another year. Sigh. However! There are some upsides to these cold autumn and winter months. There’s Halloween, Bonfire Night, and Christmas to look forward to! There are new seasonal menus at all your favourite restaurants and coffee shops – say hi to the new vegan Starbucks Pumpkin Spice Latte! Though best of all, perhaps, is the reintroduction of a winter wardrobe. 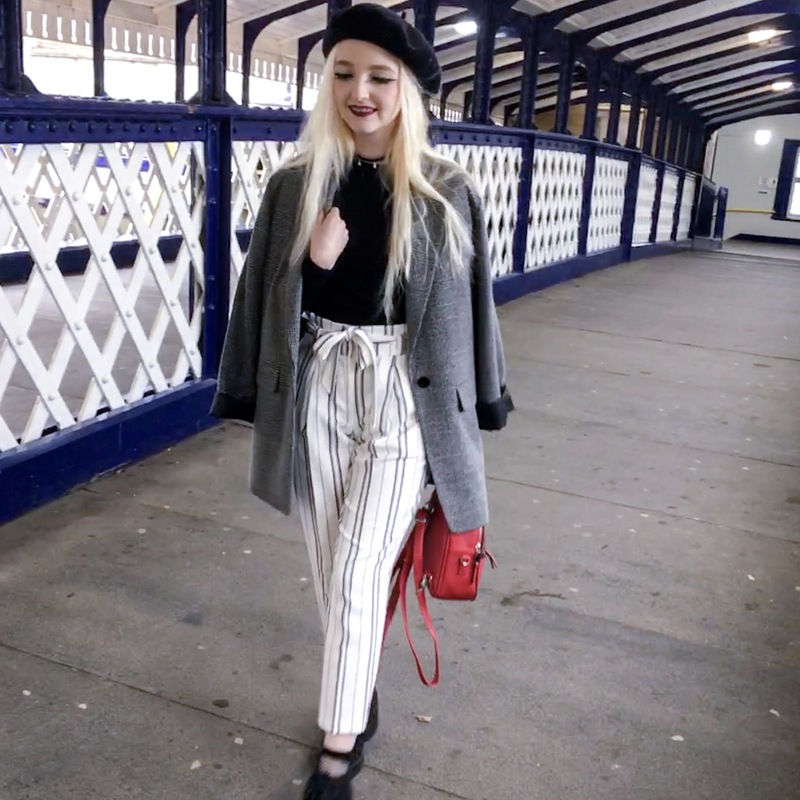 Filled with cosy roll neck jumpers, big teddy coats, and chunky boots, here are some of the new autumn fashion trends that I’m so here for. Individual sizes for each item of clothing will be listed alongside the link. For reference, I’m a petite girl, around 5-foot tall, and generally wear sizes UK 4-6 or XS/S. The first autumn trend I noticed, particularly on the high street are roll-neck or high-neck jumpers and tops. I have always been a fan of the high-neck look, but roll-neck is something I’ve come to like over time. I bought a few high/roll-neck tops and jumpers on ASOS recently and I already know I’m going to wear them to death. It’s still slightly too warm to go all-in with the roll-necks, but as soon as the weather drops (and it will drop dramatically, and all at once) I certainly will be wearing them all the time to keep my neck warm! 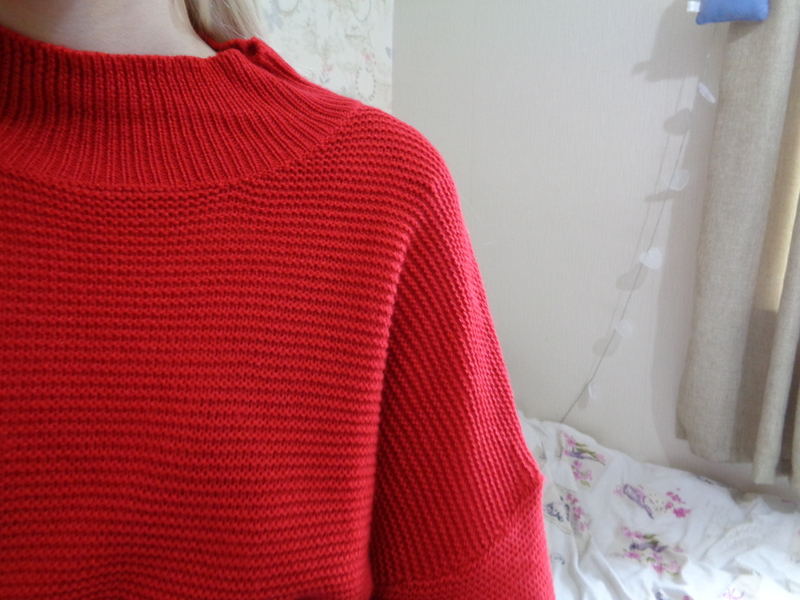 This red high-neck jumper is one that I bought on ASOS but is actually by Missguided. It’s fairly affordable at £20 and is 100% acrylic, meaning it is also totally cruelty-free! I’m always mindful when buying jumpers that they aren’t made of wool – otherwise, I wouldn’t be a very good vegan. The jumper is still super soft and uncomfortable to wear – it isn’t scratchy or irritating like some jumpers can be. I can quite happily wear this all day long without being bothered by the acrylic. Click here to buy the Missguided High-Neck Jumper in Red. I wear a size S/M. Check print has pretty much always been associated with the cooler autumn months, and every year seems to make a comeback on the high street. However, for AW18 check print has made a huge comeback on the runway in high fashion. Michael Kors, Versace, and Calvin Klein have all featured check print on their runways this year. My favourite of these is this check look by Versace (click). It seriously reminds me of Clueless! I feel like I would actually wear this outfit if it was available to me (and if I could afford it). 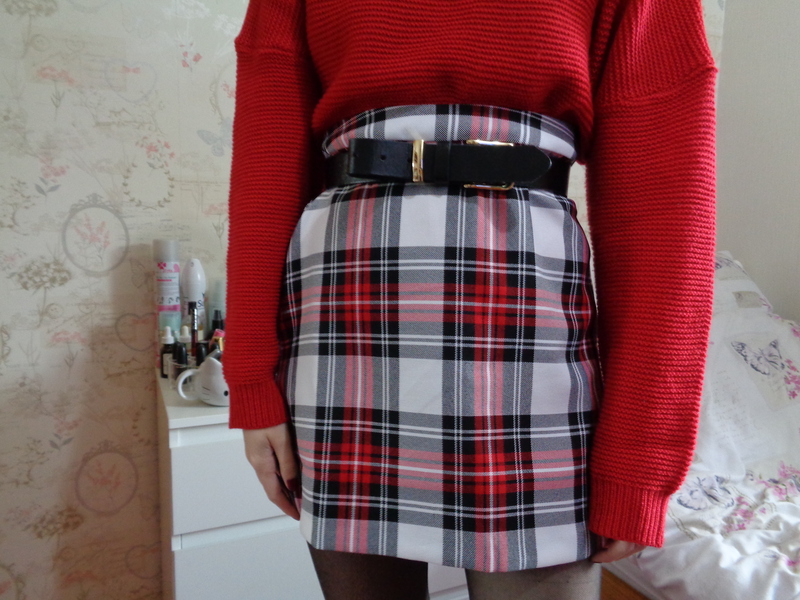 I opted to buy something much more affordable, which is this A-Line check print skirt from ASOS, priced at £20. It’s 100% polyester and feels very lightweight. It has a zip on the back so you can easily slip into it without having to fit to get it over your bum or hips, as the fabric has no stretch in it at all. I like to wear my skirts very high waisted (half because I like how that looks, half because I like to make them look shorter) but the size that I bought is actually too big to fit on my waist alone. I combat this by wearing this simple black belt from Primark which also has a custom hole in it to fit my waist (petite person problems) and fix it in place just above my hips to keep the skirt where I want it. Click here to buy the ASOS DESIGN Tailored A-Line Mini Skirt in Red Check. I wear a size 6, but a size 4 would fit me better. Unfortunately, at the time I bought it size 4 was out of stock. This seems to be another recurring AW trend of the past three or four years. Though it’s easy to see why! Both faux fur and teddy coats are flattering on everyone, they’re cute, they keep you warm when it’s cold… What’s not to like? On the AW18 runways, the big coat trend of the season is extreme layering – basically where you wear a huge coat over the top of another huge coat. I don’t really think this will catch on in the high-street fashion world, as it’s not that wearable and I don’t think it even gets cold enough in UK winters to warrant wearing two huge coats over the top of each other. Anyway, I digress. 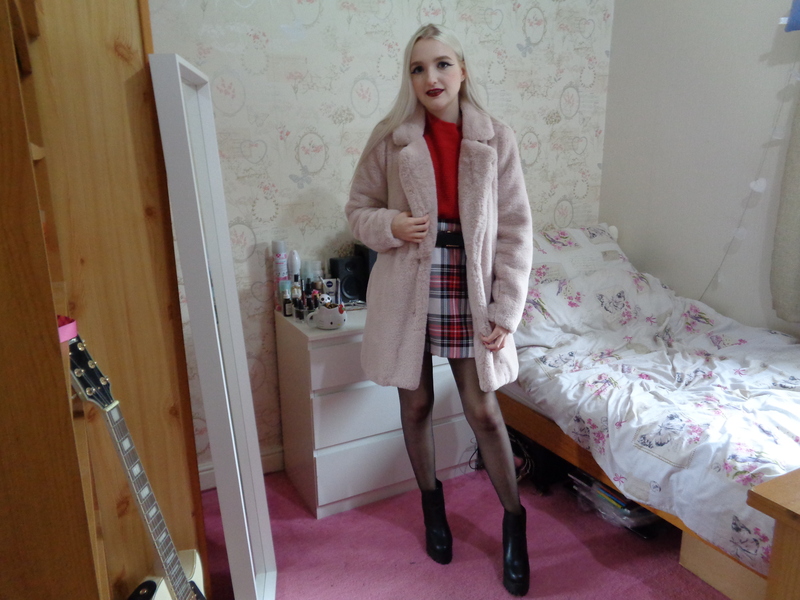 I recently saw the most adorable faux fur teddy coat in New Look when I was shopping at White Rose in Leeds. As much as a tried to leave it alone (I have far too many coats as it is) I just couldn’t stop thinking about it and I knew I would regret it if I left it behind. So I bought it. And I’m going to wear it to death! There are a few different colours, but I opted for the pastel pink one because… Obviously. It’s £39.99 so super cheap by coat standards! I can’t even begin to tell you how soft it is either. It is so soft. Please, if you’re in New Look anytime soon, find this coat and just feel it. You’ll want to buy it too. Click here to buy the New Look Petite Pale Pink Faux Fur Coat. I wear a size 6. 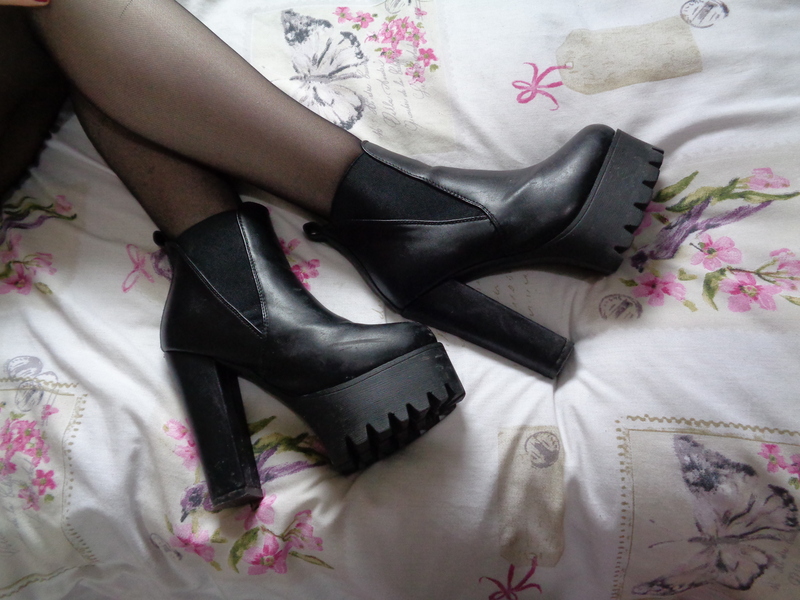 Lastly, chunky boots are a huge favourite of mine for the cooler months in the year. Warm, waterproof, and stylish, you can’t really go wrong with a good chunky boot. Chunky boots are always so easy to find at this time of year on the high street and online. On the runways, cowboy boots have been super popular this year, and although I like to think I’m even a little bit fashionable, I just don’t think I can hop on board with the cowboy boot trend. So I opted for the chunky boot instead. Again, for this post I’m going to promote my favourite online vegan shoe store, Koi Footwear (Instagram: @KoiFootwear). I bought these boots last year and they have been some of my absolute favourites to wear, both casually, and for going out-out. The heels on these are quite high, so I don’t recommend you go walking for miles in them as they might become uncomfortable, but I totally recommend them for a few hour’s wear, or if you know there will be places to sit and rest your feet every once in a while! Click here to buy the Koi Footwear Lusaka High Heel Platform ‘V’ Chelsea Boots. I wear a size 4, which is my normal shoe size and these fit perfectly. No need to size up or down. If you want a heel that’s a little smaller and more suitable for walking in, I recommend the Koi Footwear Koji Squircle Boots. These are next on my list to buy! As of the day of posting this, they also have 20% off everything and free delivery, so now is the perfect time to get your new vegan shoe fix! Also, before I sign off on this post. You may have noticed another little trend in this post alone, which is the colour red! Red has actually featured heavily on the AW18 runways, but I didn’t feel like I could write enough about it to give it it’s own section. If you look around stores on the high street, you’ll notice there are tons of red items around at the moment. Are you excited for autumn and winter? What trend are you most excited to wear out? "Non-Vegan Products From Cruelty-Free Brands: A Small Rant"
"Revisiting Popular Instagram Fashion Trends From 2014"
Excited about fall, we had am awesome summer. Love the high neck sweater!